I recently read an article by Jonathan Witt - science writer and co-author of "Heretic: One Scientist's Journey from Darwin to Design" which describes bioengineer Matti Leisola's (the other co-author) gradual rejection of Darwinism and embrace of intelligent design. In his article titled "A Father, an Atheist Son, and a Darwin Heretic" Witt describes the attempt of a father to get his son - a scientist and an atheist - to consider the claims of intelligent design by reading Witt's and Leisola's book "Heretic." Though Leisola has 140 peer-reviewed papers, the son rejects them because "the tiny few that are explicitly pro-design were published by the journal BIO-Complexity. The son dismissed the journal for its connections with Discovery Institute." In the son's opinion, both Witt and Leisola could be ignored because they were shills, "paid guns" for intelligent design. There's an implication that proponents of ID have ulterior motives while those scientists pursuing materialistic only theories (read Darwin supporting) were "untainted by bias." "Scientific paradigms can work powerfully precisely because they encourage scientists like this man’s son to avoid engaging certain arguments and evidence, and to do so as naturally and easily as they breathe air." "The response of your son is revealing. He is not really engaging himself with any of the arguments for design or against evolution but only attacks Discovery Institute and questions the motives of the critics of Darwinism." That response is right on target. Bullseye. Not only did the atheist-scientist-son refuse to engage himself in any arguments for design, he refused to even look at them. Which reminds me of the situation for which D. James Kennedy taught an apt response to in his gospel presentation approach "Evangelism Explosion." For those rejecting the presentation because they don't believe in the Bible, particularly educated people (proud of their knowledge - like scientists tend to be) Kennedy taught what he called the judo approach - to ask what their "understanding" of the gospel is. Not whether they believed it, simply what their understanding was (which is reminiscent of Jesus - see Luke 10:26). If they could not explain it, the follow up was "That's just what I was afraid of...you have rejected the Bible without even understanding its main message." and thus exposing their ignorance, which is often enough to throw them off their high horse and at least listen. As Leisola points out, such is the case with the atheist-scientist-son, and in fact, such is the case for most who reject the evidence of intelligent design. Many reject the evidence having never seriously looked at it. While I suppose we could write an approach similar for use with intelligent design, I suspect it would not be nearly as successful or useful. Why? Because of the question posed in the title: Can you find something that you deny exists? The answer to that is no. Because even if you look, you don't do so seriously; and even if you find evidence of the item, you don't take it as evidence because you deny the item exists. And thus typically you (or someone) makes up some story why what is obliviously evidence isn't really evidence. 1. The brain operates like a computer - taking the embedded 2-dimensional information and processing it like a computer to produce a single 3 dimensional image and presents the unified 3D image back to your mind. 2. Everyone knows computers do not come about by random chance, they are designed. You don't believe that the PC, Ipad, mobile phone or whatever device you're reading this on came about by random chance do you? Nor do you believe even if given a billion years - your device could be created by natural, purposeless, unintelligent forces, do you? It could only come about by design. 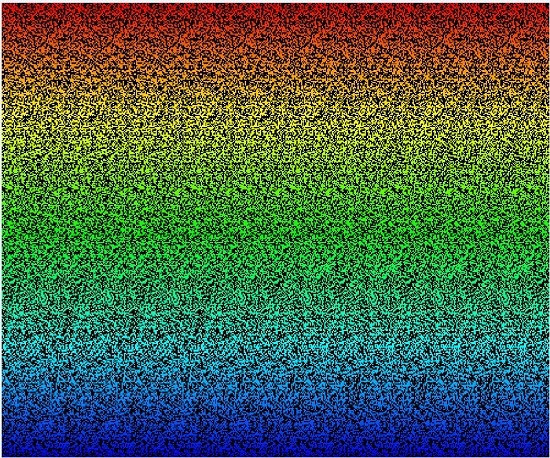 Thus it's clear that since the brain also operates as a computer (as random dot stereograms demonstrate), it's also clear the brain could only come about by the design and purpose of a super-intelligent designer. While the stereogram was on my desk I had people come by and ask me what it was. I explained to them it was a stereogram, and embedded in the random dots was the 3D image of a mermaid. Some saw it. Some did not. Some would look briefly at it and tell me I was lying, there's no mermaid in there. Such are like the atheist-scientist-son - denying what's there without seriously looking at it. Well I can assure you there was indeed a 3D mermaid image embedded, and I would reproduce the same image for you here, except that the publisher - Magic Eye - currently sells books of these stereograms (one from which I got the poster from) and I don't think they'd appreciate me giving their image away for free. But so you could experience what I'm talking about I created my own. The above image is the result. For those unfamiliar with such stereograms the "trick" to seeing the image is to focus not at the surface of the page, but beyond it. Let your eyes (and it does require two eyes) rest unfocused on the image. Like you're looking beyond the page. After a while like a ship appearing out of a mist you should begin to see the embedded object(s) appear. 1. I guarantee you'll not find something you deny exists. Because you'll never seriously look for it. This is why so many can't see the evidence of intelligent design, and why atheists can't see the evidence of God. They deny both exists, and thus never seriously look at the evidence. And even if they see the evidence, they deny it's evidence (since they deny the item exists) and attempt to explain it away (however ridiculous the theory might be - like Darwinian evolution). The result being though they may see it, they don't perceive it (Matt 13:14) as evidence. 2. I guarantee there's an embedded image in the above random dot stereogram. If you want a hint - it's a teapot resting on top of a 3D cone. Here's a 2D image of what's embedded as another hint. 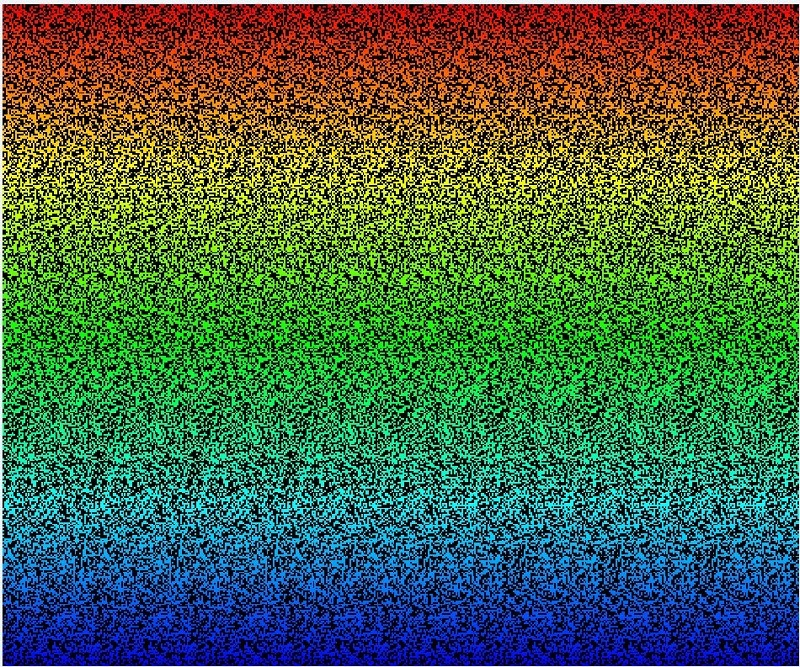 You may have a hard time seeing a random dot stereogram. But God promises to be found if you look for him - believing he exists (Heb 11:6) and knowing that he's waiting for all who seek him.